No post today and no adventures, sorry. 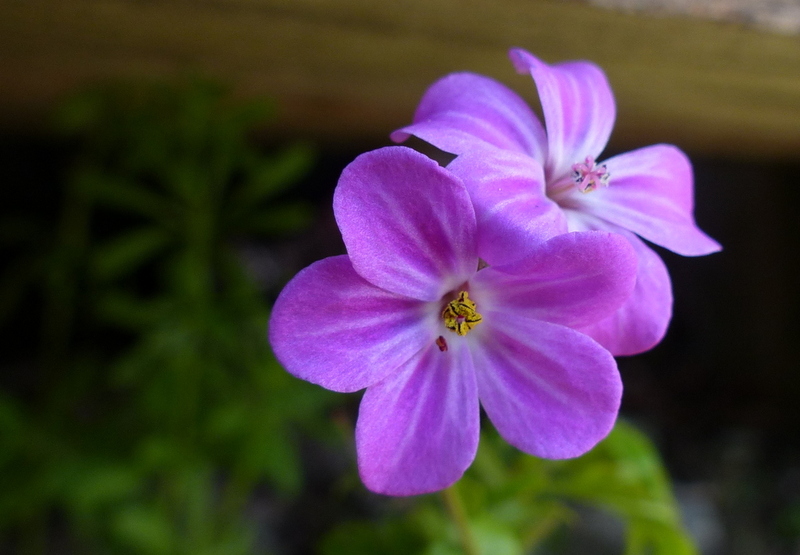 I woke up this morning and flicked through my library looking for a flower to write about and chose Geranium robertianum from the deck. 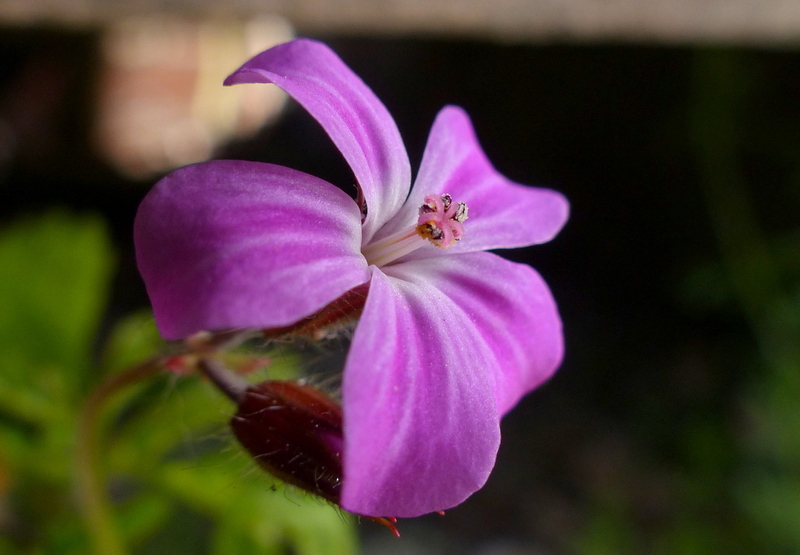 Only to find that I didn’t have the photographs to illustrate the seed dispersal of a crane’s-bill geranium. There was nothing else for it we would just have to go out and get some. So that is what Fizz and I did. We decided to put our brains together for this project. Okay neither of them are very big but I used to have bigger frontal lobes. 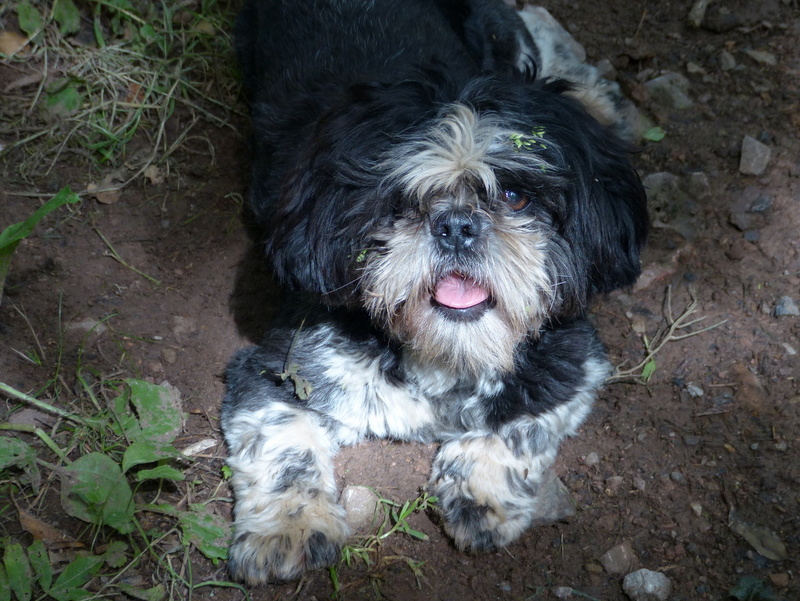 Fizz is a practising botanist, she is not a brain surgeon but fortunately I am (practising to be one). 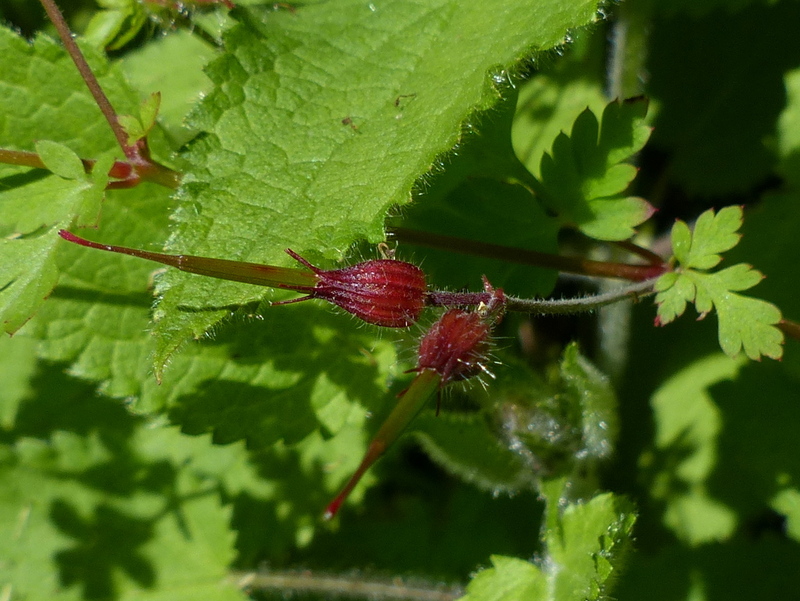 Botany: Herb Robert is still about but finding seed pods in the right state of dispersal to illustrate my article was going to be no easy task. I just didn’t have time to write a post today. We did find what we went after and I got some pictures, they were not as good as I would have liked but they do illustrate the point. We came home and I wrote about Stinky Bob and that basically took me all day. I know that a few of you have done this writing a novel in November thing but I just wouldn’t stand a chance. I have to research everything and check everything. One hundred and fifty words takes me about six hours. I spent all day writing this post and so I am going to put it here. 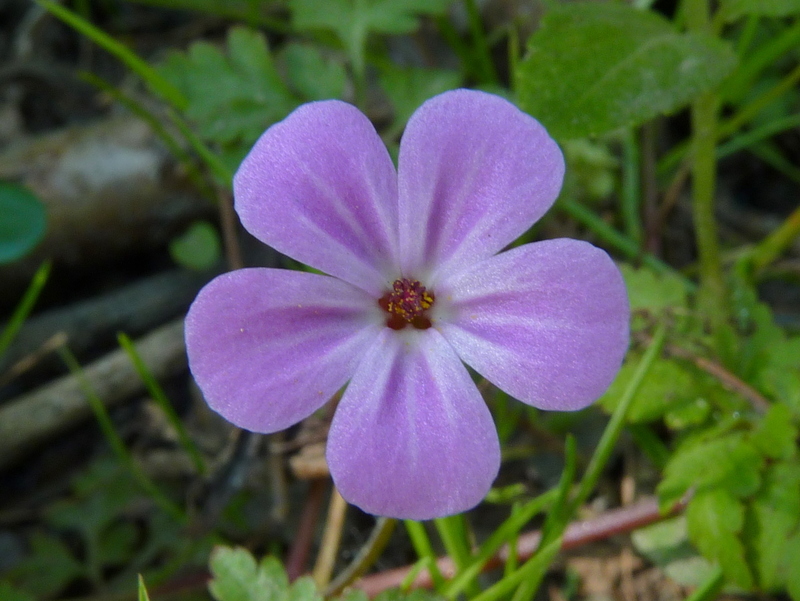 Officially the flowering season is May to October and the flowers are certainly much more abundant then but this is one of those flowers that is so common that I can find it in any month of the year. 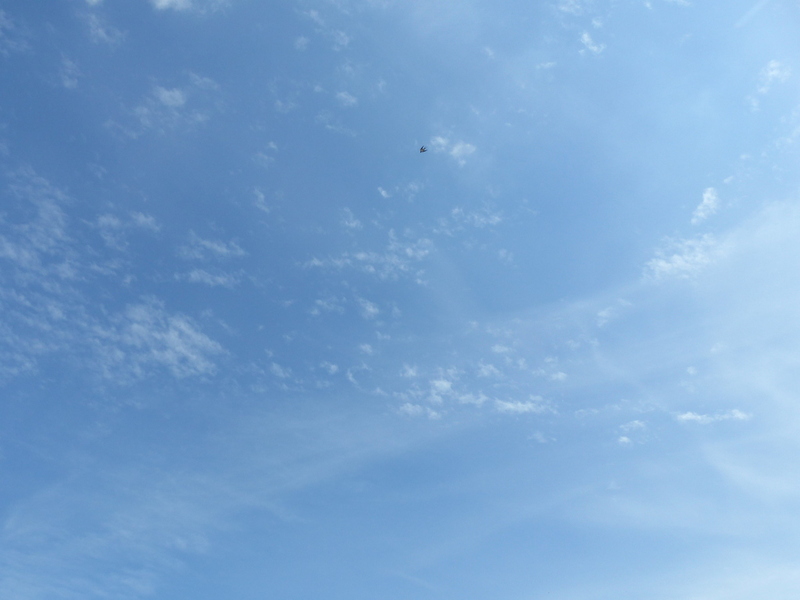 I took this next photograph (today) in December. 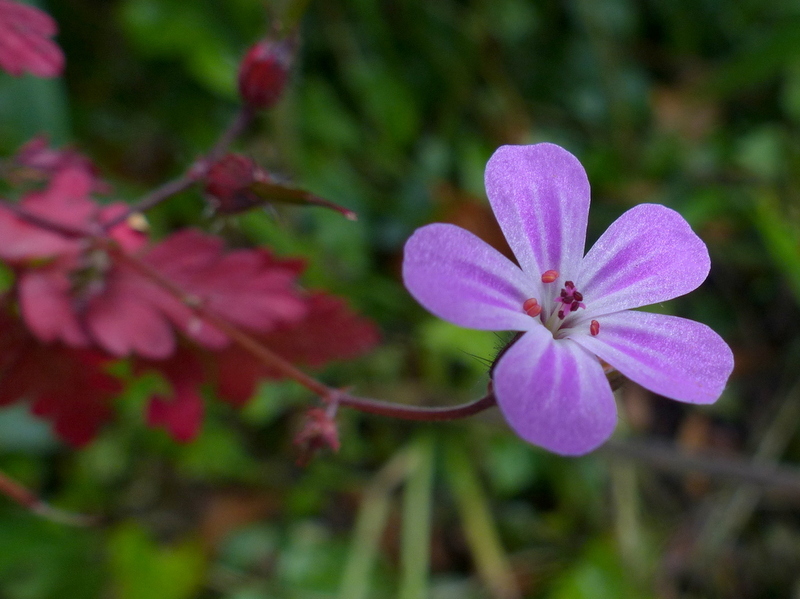 It is a woodland flower and is said to be an ancient woodland indicator species but it seems to grow everywhere, it grows happily in hedgerows and I have yet to see a garden without Herb Robert growing in it somewhere. 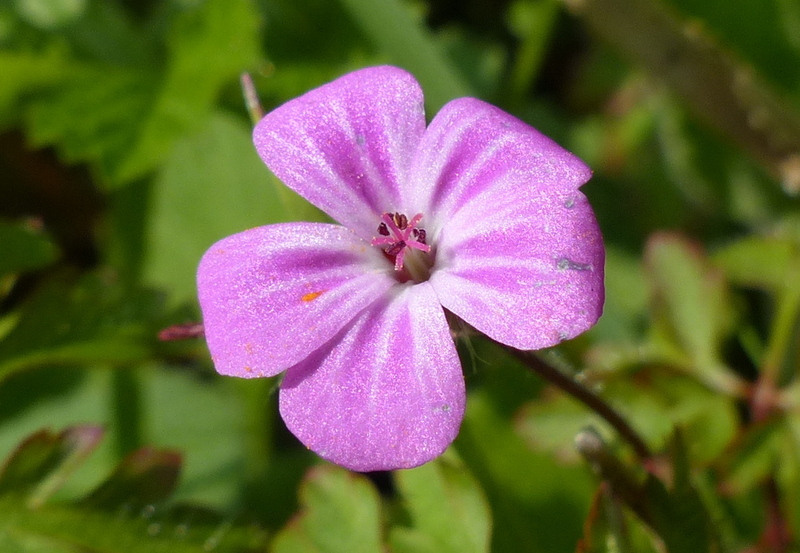 To many people it is an annoying weed but in the wild it is a valuable wildlife flower. In some parts of North America it is known as Stinky Bob. This is because the leaves have a pungent odour. I have heard this variously described as Mousy, like a Fox or burning rubber. 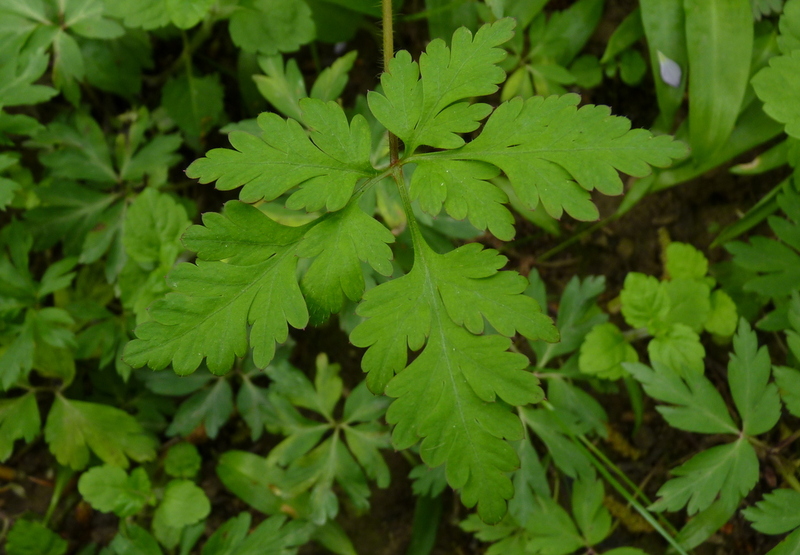 The smell acts as a natural insect repellent and rubbing the leaves on yourself is said to repel Mosquitoes. 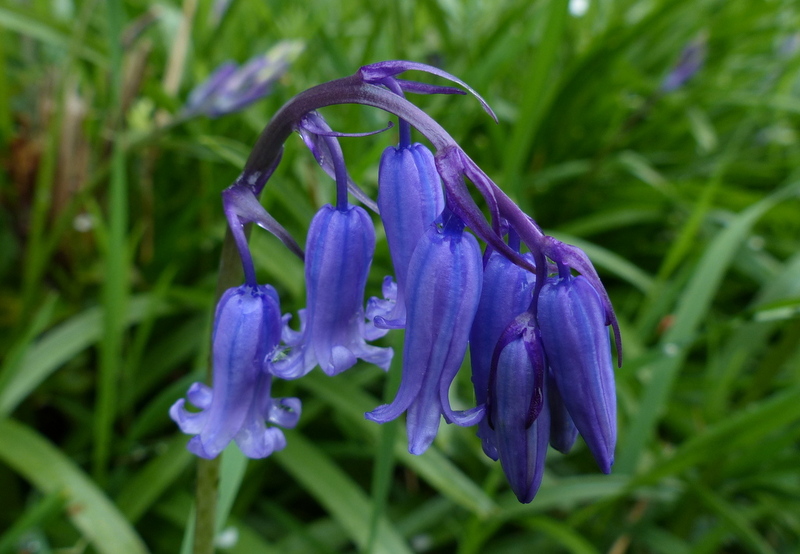 Gardeners take note, Stinky Bob is not troubled by insect pests and allowing it into your garden might keep pests away from your more vulnerable plants too. 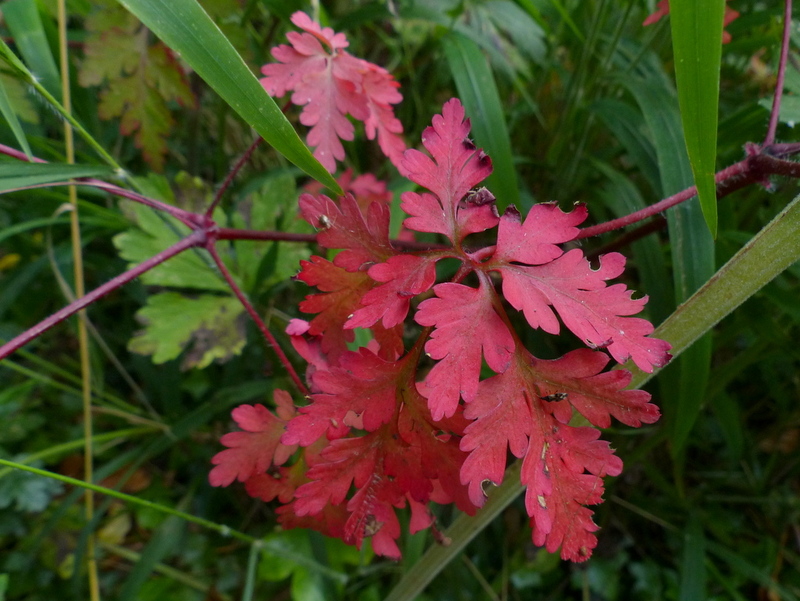 The stem and leaves often have a red cast to them. I do not often see them as red as in this next pictures but it does give a good idea of shape. 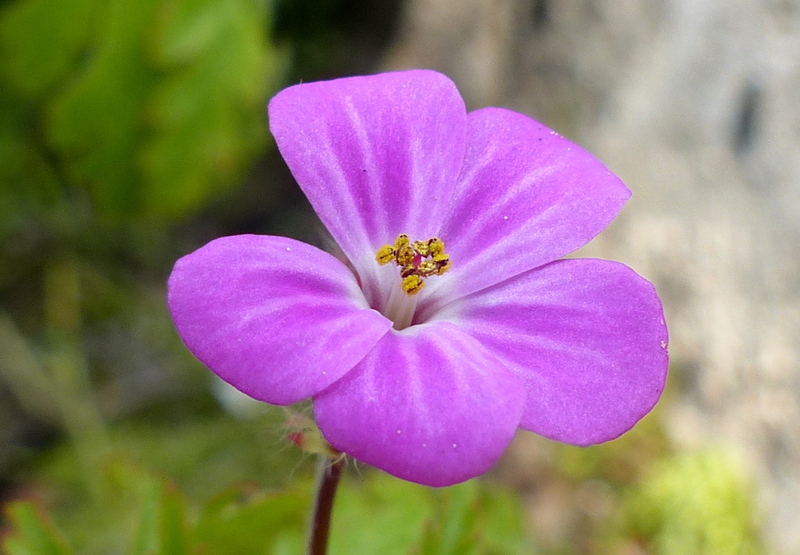 Herb Robert is a Crane’s-bill Geranium. 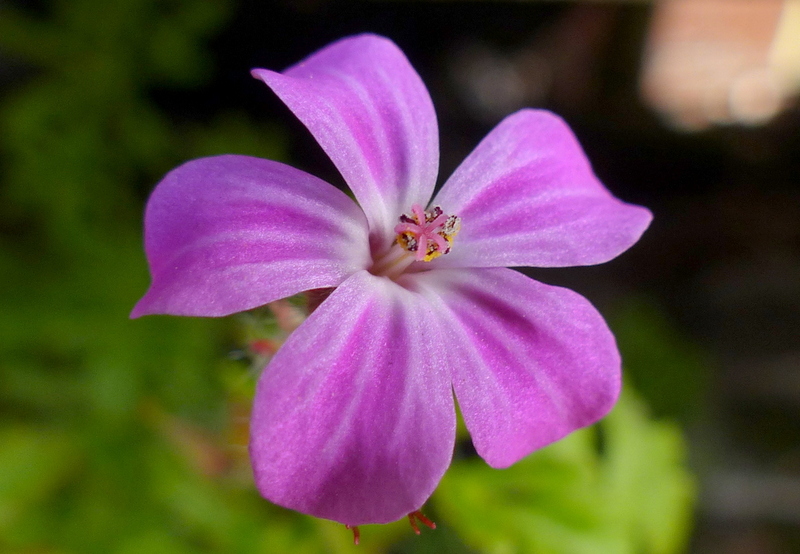 There are 422 different species in the genus Geranium and they are called Crane’s-bills to differentiate them from the genus Pelargonium because Pelargoniums are commonly known as Geraniums. Does that make sense? Many of the Crane’s-bills have seed pods shaped like the bill of a Crane. These seed pods are actually catapults designed to hurl the seeds away from the parent plant and they can travel as far as twenty feet. 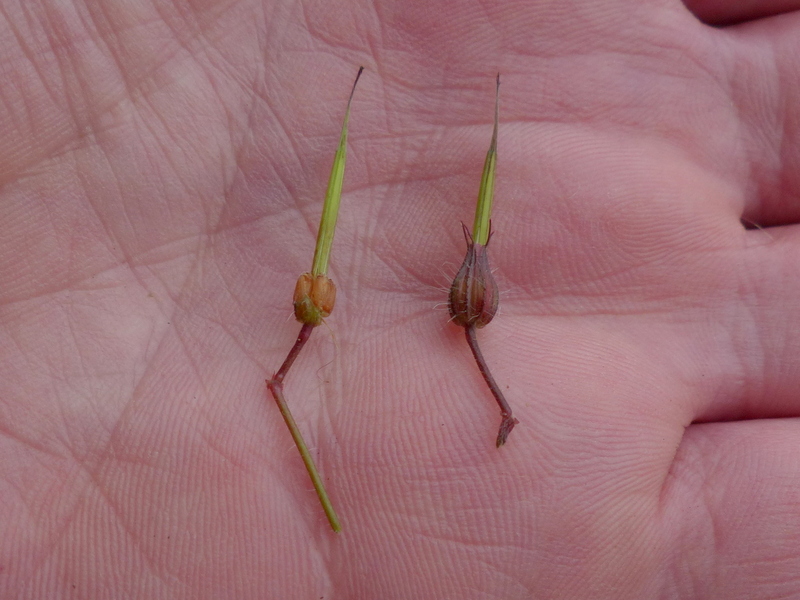 The seeds are in the red casing at the base of the pod. 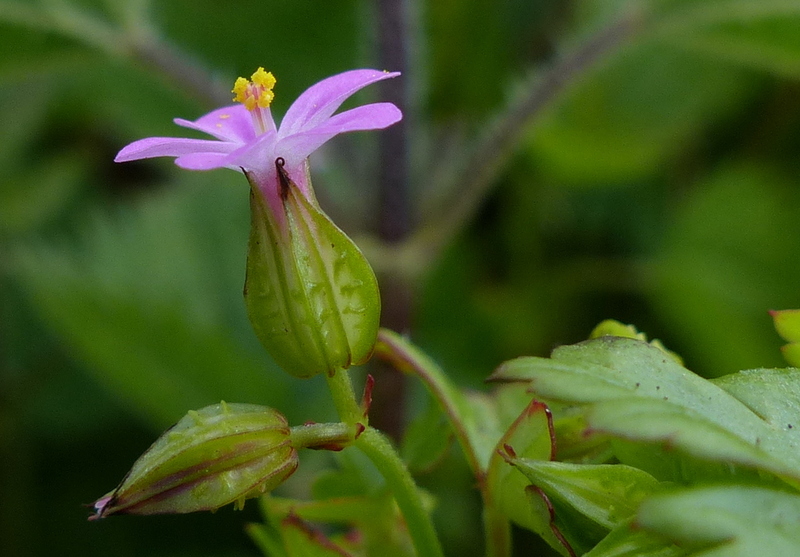 That casing is called the calyx and is formed by the sepals of the flower. 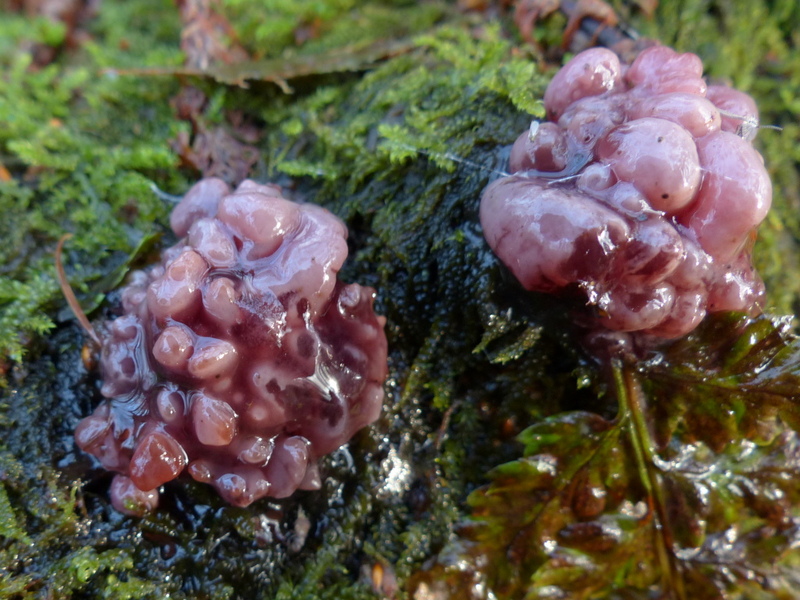 In this next picture I have peeled the calyx back to expose the seeds. 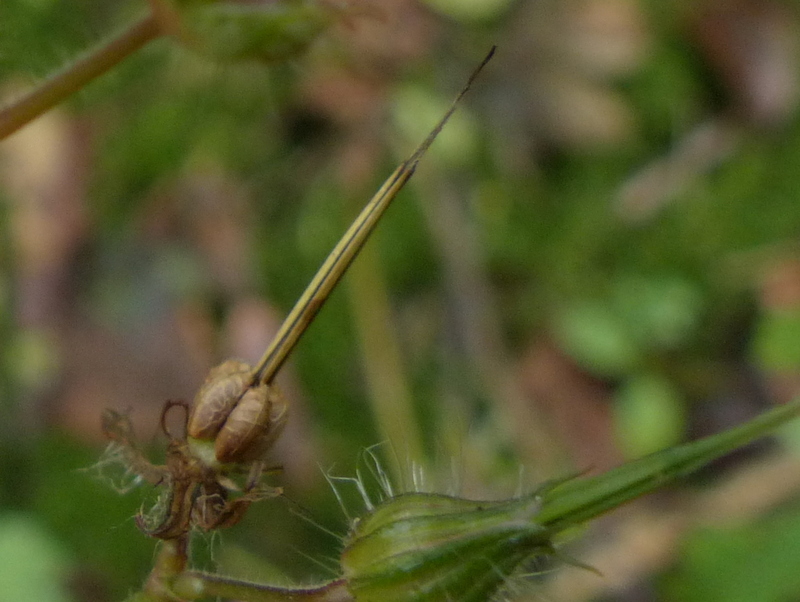 There are five seeds at the base of the pod, each attached to a spring which runs almost to the tip of the “bill.” When the seeds are ready to release the spring will curl outward from the base with enough force to detach itself from the tip off the pod and the seed will be distributed. This next picture demonstrates a “Fail,” The seeds have not left the pod, possibly due to Spider web interference. It does however show the seeds and the springs sprung. 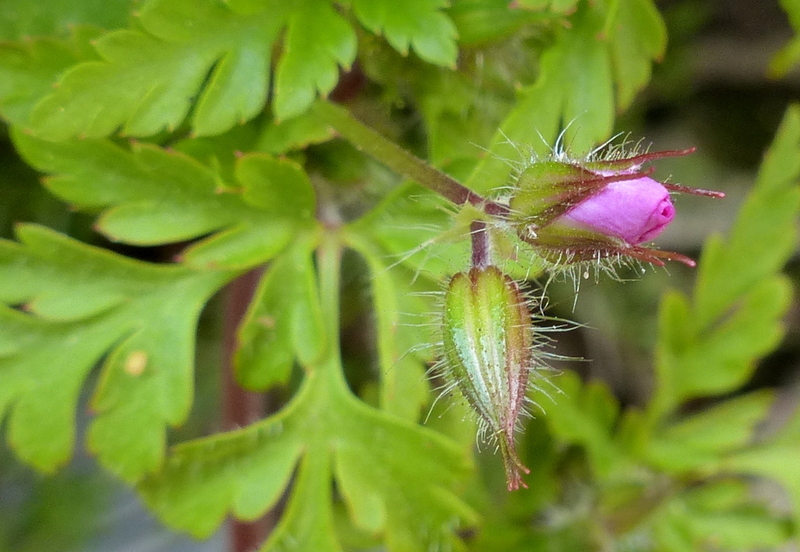 Well that is how Herb Robert’s crane’s-bill works. Others work in different ways. 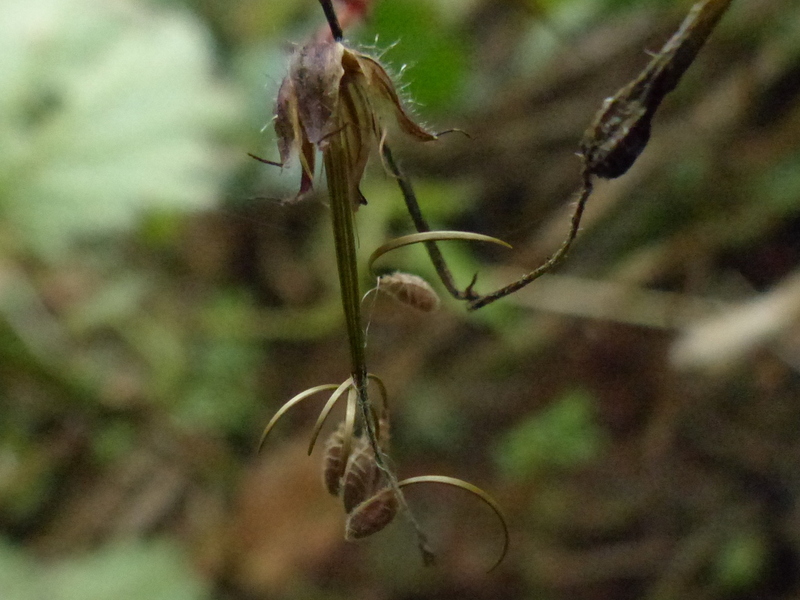 In many species the seed sits in a cup at the base of the pod and when the spring fires only the seed is thrown, the spring and cup remain attached to the pod. 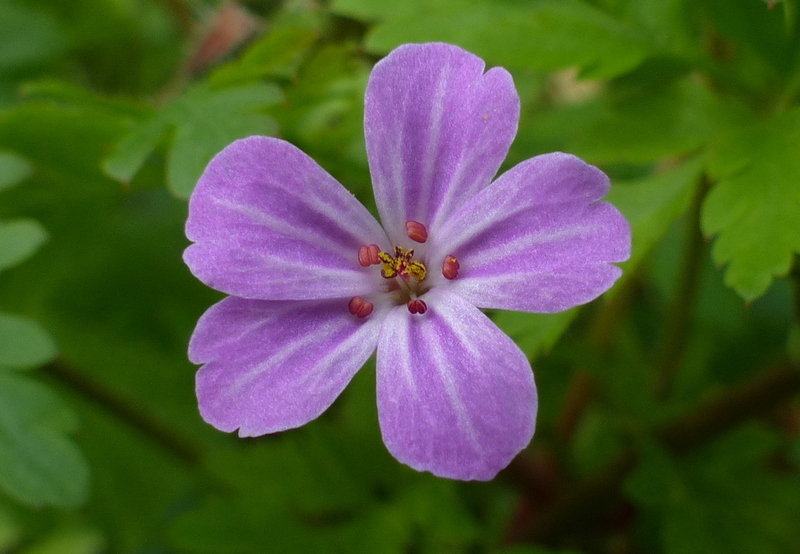 Crane’s-bill geraniums have five petals. 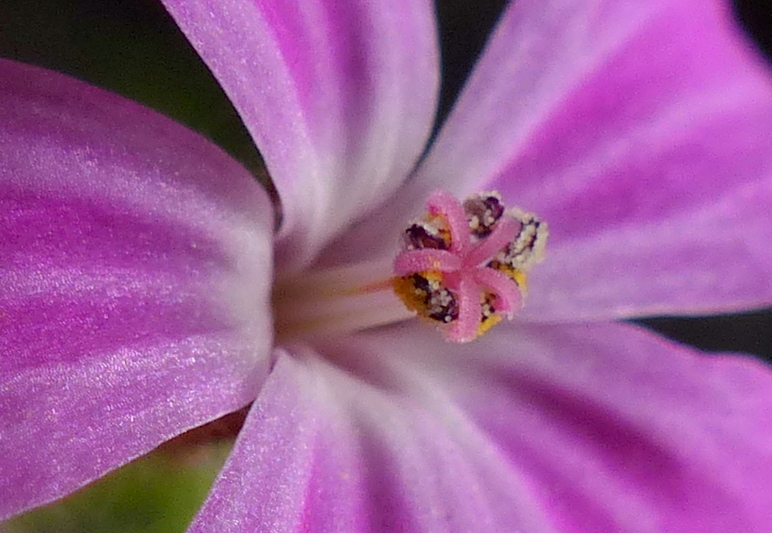 When the flower first opens the stamens are held very close to the styles.At the tip of each stamen is an anther, this is the part that produces pollen. 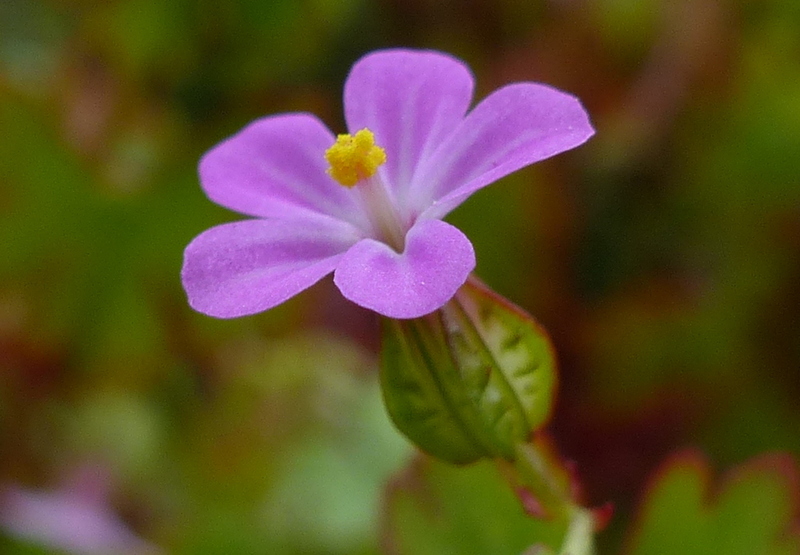 The pollen of Herb Robert is golden yellow. 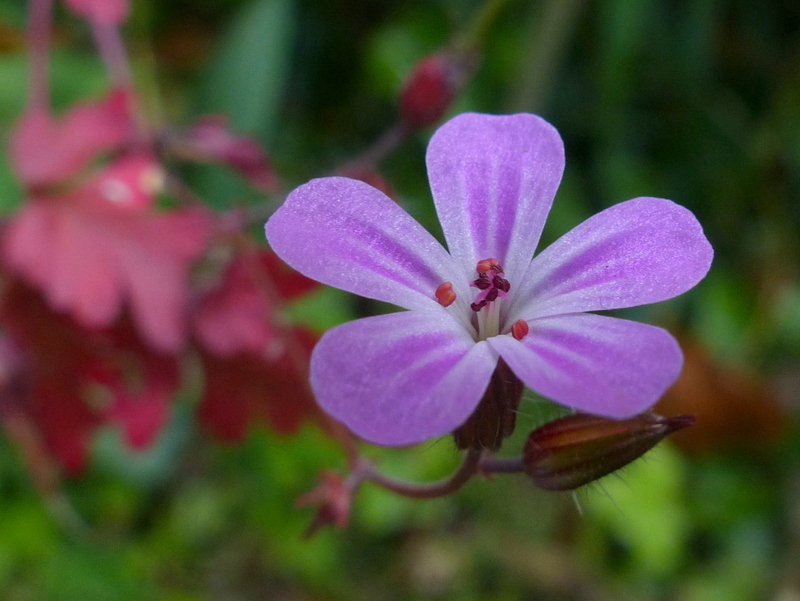 Herb Robert is native to the UK, Ireland and Western Europe. Your knowledge is astounding, taking second place only to the ease in which you manage to pass it on to those, such as myself, who lack it in the first place. Thank-you very much. 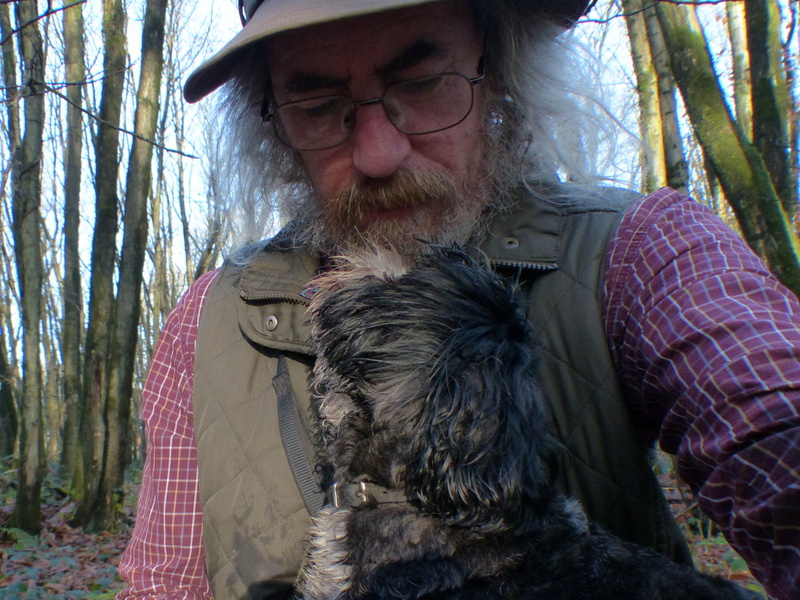 Thank you for the introduction to Stinky Bob … isn’t Nature wonderful! 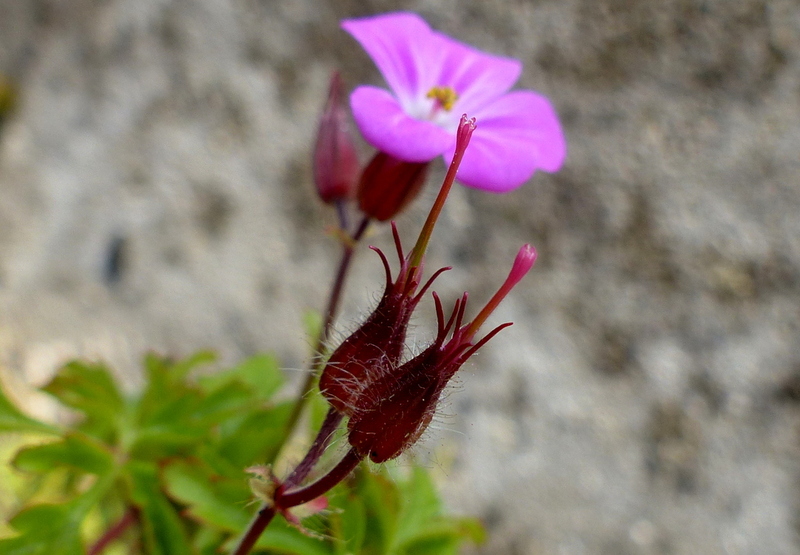 What brilliant photos, amazing how the flower is in such good condition even in December. And to find a bumble in it too! She looks like a Bombus Hypnorum, the tree bumblebees that have come to this country fairly recently. This certainly counts as a post and as an adventure too. 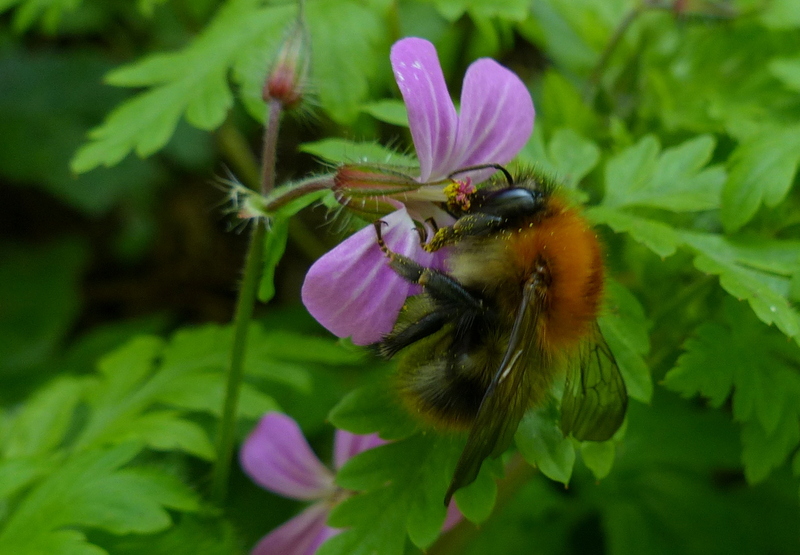 Is that a tree bumblebee or a very orange common carder? 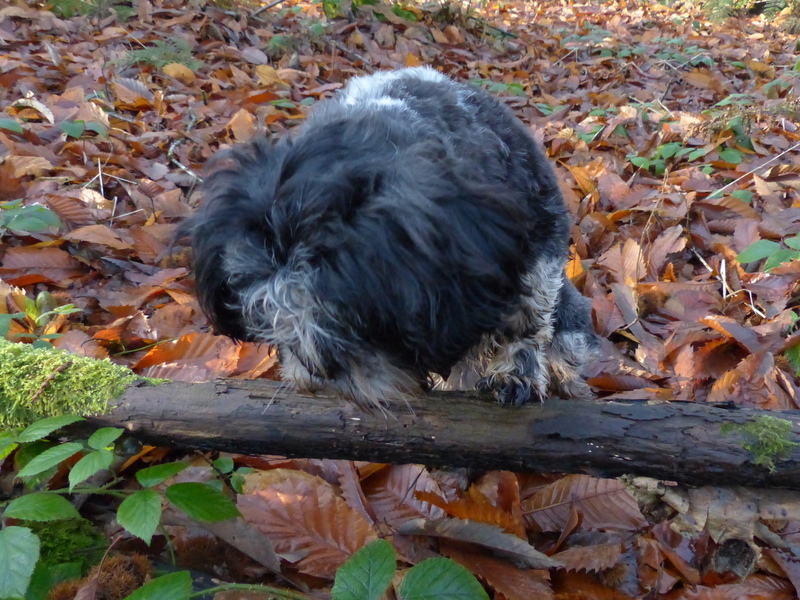 Can’t quite see if it has a white tail. Thanks Marc 🙂 Emily spotted that one too. I am not sure, I had it down as a Common Carder without thinking. I haven’t got any decent shots of the tail for that one but will check out some of my other “Common Carders” later. Many thanks. Perhaps it is, I did wonder that but thought common carders were usually the same colour all over. But perhaps this one has an unusually dark abdomen. Beautiful either way. Thanks Colin. I have a list of LFPs somewhere that I was given by the appropriately named Colin Plant. He is the recorder for VC 20 & 21. I must try to find it. I have bookmarked the database. I really loved the flowers. They were so beautiful.Thanks for sharing. 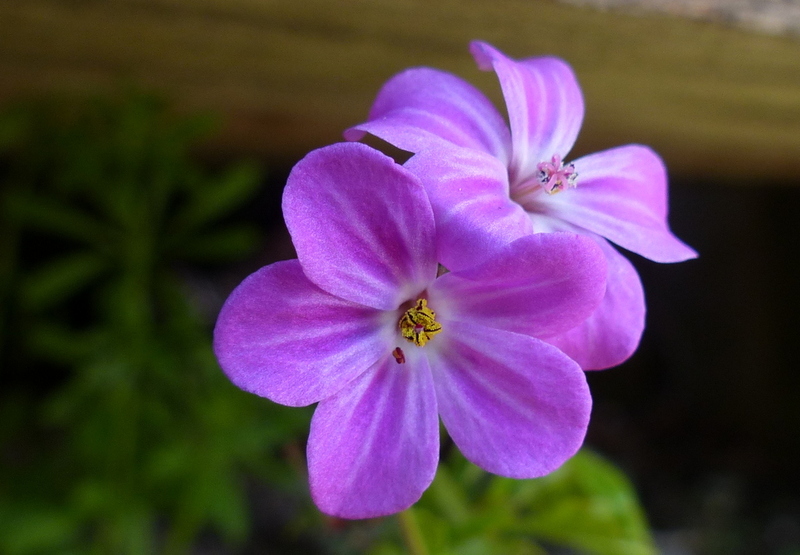 I think Stinky Bob should be called Pinky Bob, since he is very delightfully pink and gay 😉 Otherwise Herb Robert sounds much more noble. All in all a loaded pistil of ripe projectiles makes for a surefire trajectory for this nonesuch non-pen non-sense! 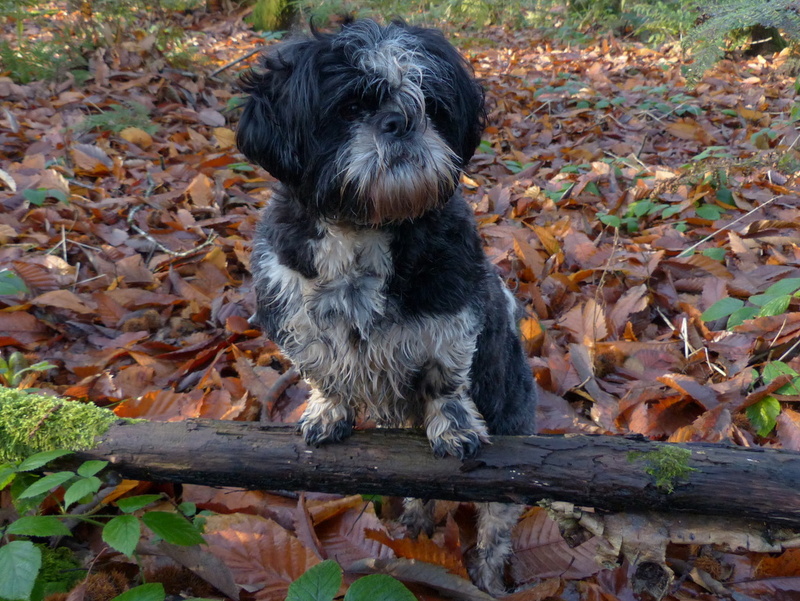 Nothing nonchalant about this ramble!